This is such a nice fall recipe, we’ve made it several times—and we’re just a few weeks into fall. 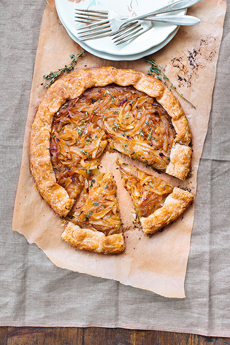 Savory and sweet combine in this galette: caramelized onions and apples. Called crostata in Italian and rustic pie or rustic tart in English, the concept hails from the days before people had pie plates, and the days after that when only the kitchens of the wealthy had them. The precursor of the galette probably dates from the Neolithic Age, now called the New Stone Age, which lasted from about 10,200 B.C.E. to between 4,500 and 2,000 B.C.E. Thick cereal pastes—barley, oats, rye, wheat—were sweetened with honey and spread on hot stones to cook. This recipe comes from Good Eggs, and was inspired by Alice Waters’ onion tart recipe in The Art of Simple Food. To save time, take the semi-homemade route. Use ready-made pie dough for the crust. It’s the perfect base for the recipe, and you’ll still have the fun of shaping it. *If you’re using a frozen crust, it should be defrosted, but still cool. This savory-sweet galette can be served as a first course, with cocktails, or as a light lunch with a green salad. We served it for dessert with a cheese plate:a great idea (photo courtesy Good Eggs). 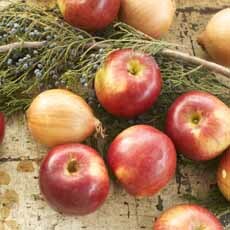 Apples and onions make a savory-sweet pie (photo courtesy Cubit’s Organic Living). 2. ROLL out the chilled pie dough on a well-floured surface, into a 12- to 14-inch circle (about 1/4 inch thick). Don’t worry if your shape isn’t perfect” any irregularities just add to the homemade charm! 3. TRANSFER the rolled-out dough to a baking sheet lined with parchment paper and let it firm up in the fridge for about 10 minutes. Spread the cooled onions over the center, picking out the thyme sprigs. Leave a good inch or two around the edge so you have ample dough to fold up around the onions. 4. FOLD up the edges, making sure there are no holes. You can freestyle it, or you can use a pinch-and-fold method as shown in the photo. Once the galette is wrapped up, coat the folded edges with beaten egg, using a pastry brush or your fingers. 5. BAKE for 40 to 50 minutes, or until the crust is golden brown on the bottom. Let it cool slightly, garnish with a pinch of fresh thyme and serve warm.